Young readers get introduced to letters with rhythms, rhymes, songs, and chants, all of which are crafted to move quickly through the alphabet. A and Z get the most prominence, and all of the letters in between can feel like nothing more than a means to an end. This experience is often mirrored as leveling systems are used to place appropriate books into readers’ hands: there is a beginning level (perhaps Level A or Level 1, depending on the system being used), and success in reading is measured by movement through the levels until at last a student emerges with the ability to read a Level Z (or whatever the system’s endpoint is called). Reading levels are a tool meant for teachers to use as they support students with book choice, helping them access books they can enjoy, read, and understand. They are not a progression of reading steps to be hurried through. After working in many classrooms over many years, I believe the point can be made that all levels are not to be viewed equally; there are points along the way where, as teachers, we may want to pause and reflect on what a reader is able to do in their thinking about text, and what we might support them in doing before moving on to that next letter or number. Is the reader able to manage the increased volume of text? Does the reader have the maturity to truly understand the relationships between characters? Is the reader able to make higher-level inferences as they critically analyze story content? Does the reader understand the importance/role of the setting in the story? What is the reader’s understanding of the author’s message? Can they speak deeply about the author’s intent or are they capturing general themes that appear often in literature? Have they moved to being able to summarize the story, citing pivotal moments in the story to share? What is the depth of the questions they are asking about they text? Might it be beneficial for them to linger at the earlier levels, strengthening their use of the reading comprehension strategies they are learning as teachers support them in deepening their thinking about their reading? Might it be beneficial to allow these readers to have a little bit more life experience before asking them to talk in a knowing way about the complexities of character relationships, or to interpret dialogue with a character’s feelings in mind? We know that no two readers are alike and that perhaps there are young readers who are able to do this heightened thinking about their reading. Many readers, however, would benefit from the power of the pause, from spending additional time in a lower-level text to help prepare them for the demands of the texts they will be facing as they grow into lifelong readers. 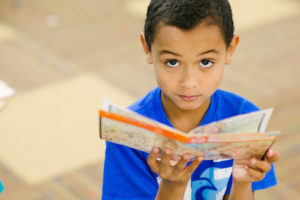 To continue the conversation, read the blog Using Reading Levels to Guide by Kathy King Dickman.